Just by transforming the categorical target with continuous values. The idea of logistic regression is to make linear regression produce probabilities. It's always best to predict class probabilities instead of predicting classes. Logistic regression estimate class probabilities directly using the logit transform. The Linear regression calculate a linear function and then a threshold in order to classify. The result is logistic regression, a popular classification technique. It's tempting to use the linear regression output as probabilities but it's a mistake because the output can be negative, and greater than 1 whereas probability can not. As regression might actually produce probabilities that could be less than 0, or even bigger than 1, logistic regression was introduced. In linear regression, we have a linear sum. 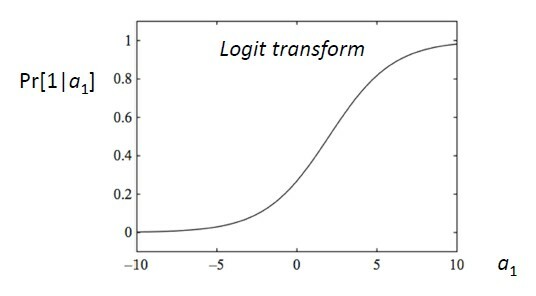 In logistic regression, this linear sum are embedded in a formula: the “logit transform”. It's a sort of S-shaped curve that applies a softer function. It's a soft function of a step function (Never below 0, never above 1 and a smooth transition in between). So this is a special construct, a transformation of a linear model to guarantee that what we get out is a probability. or the logit transformation of the probability. To summarize, we got still a linear model but it's modeling the probabilities on a non-linear scale. With the model above, how do we estimate the parameters from the data? Instead of minimizing the squared error as in a linear regression, we choose the parameters in order to maximize the probability. This method is known as the maximum likelihood. The P-value for the intercept is not really important. The intercept has largely to do with the preponderance of 0's and 1's in the data set. The slope is really important.